We know Maestro Chambers as the conductor of New Amsterdam Opera where he is putting on some wonderful opera, the latest of which was Verdi's La Forza del Destino. His lovely wife Kirsten was heard and enthusiastically reviewed in Fidelio. Mikhail Svetlov, however, is a basso previously unknown to us. 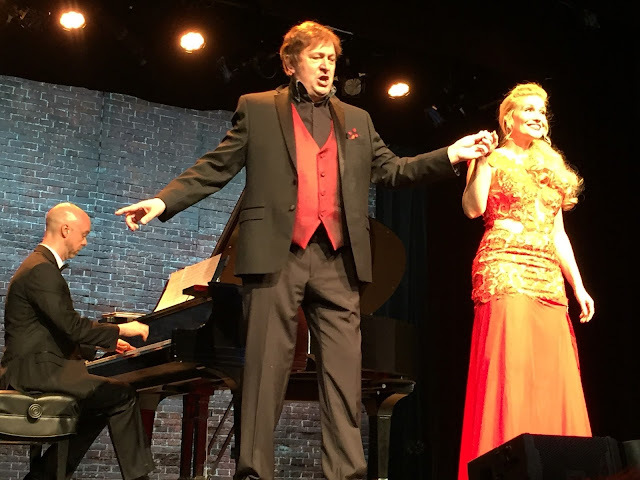 Last night at the Sheen Center, the three appeared for New Opera NYC which will be producing Nikolai Rimsky-Korsakov's opera The Golden Cockerel May 18th to the 21st and we have already put it on our calendar. What an opportunity to hear a work we've never heard! But last night's program comprised a varied program of opera, art song and Broadway favorites. For us, the highlight of the evening was Ms. Chambers' performance of "Vissi d'Arte" from Puccini's Tosca. She showed all the conflicted emotions of Floria Tosca--the despair, the incredulity, the guilt. Come to think of it, she did the same with Turandot's aria "In questa reggia" from the Puccini opera Turandot. One could feel the fear and vulnerability of the character underneath the icy exterior, which is important if we are to forgive the character for her brutality and to realize that she is worth Calaf's risking his life to win her. Ms. Chambers has a sizable soprano which she utilized well in the "Liebestod" from Wagner's Tristan und Isolde, a role she covered at the Metropolitan Opera, and also in Elizabeth's aria "Dich, teure Halle" from Tannhauser. We also enjoyed a song by Sven Lekberg entitled "The Spring and the Fall'. Every word was clear and the song benefitted from the rhyming text. Ms. Chamber's warmth here was engaging. We didn't enjoy "La ci darem la mano" as much. Part of the problem was a mismatch between Ms. Chambers and Mr. Svetlov. Her elegant and glamorous appearance did not suggest a cute little peasant girl. However, it was a cute "wrinkle" to have her be rather overeager towards the seducing Don Giovanni. The Russian basso is a fach which we usually enjoy but we found Mr. Svetlov's bass to be gravelly and not too pleasant. His best effort was in Rachmaninov's "Ves tabor spit" from Aleko, an opera we hope to hear someday. We generally love "Spring Waters" but his performance was too bombastic for our taste. We prefer a lighter touch for that song. He also sang "Come dal ciel precipita" from Verdi's Macbeth, in which Banco is warning his son to escape the assassins. He sounded better in the lively aria "Fin ch'han dal vino" from Mozart's Don Giovanni and showed sufficient flexibility in "Le veau d'or" from Faust, which he also did in the wonderful aria "La calunnia" from Rossini's Il Barbiere di Siviglia. We thought it was a grievous error to have this pair sing "Bess, you is my woman now" from Gershwin's Porgy and Bess. Hearing a Russian accent and an educated American accent trying to imitate the dialect of Catfish Row sounded almost funny. We are anything but "PC" but this smacked of cultural appropriation. It also felt wrong to hear Mr. Svetlov singing Broadway tunes with his Russian accent. It didn't add anything to the program. As always, Mr. Chambers' piano was elegant and supportive.